By Paul Whitby If you have been following this series of articles you should now have a good handle on how to treat pest aiptasia, majanos, and those dreaded nudibranchs. All of these can be readily killed in or out of the tank. Those are the easy pests to deal with. In this, the last of the three articles on pests, we turn our attention to the real nasties-the flatworms. With that being said not all flatworms are a major cause for concern. Some are totally innocuous and are a vital part of the marine microflora. Their brothers and other related species however pose a very real threat to the long term viability of a marine system. These guys are the masters of disguise, they are subtle killers that creep around at night, hide behind corners and occasionally grow so large that they will truly freak you out. So, without further ado, let’s look at the common flatworm pests we may encounter. 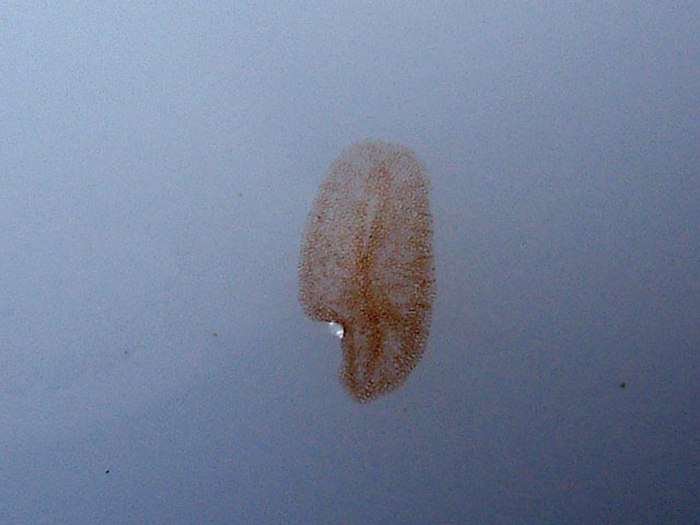 A Red Flatworm infestation on the glass of a sump. Red Convolutriloba populations are very much controlled by nutrient availability in the system. Detritus accumulation leads to an increased pod population, which leads to an increased flatworm population. For the most part, the levels of these critters will wax and wane for no apparent reason. My personal experience from several years back, is that the visible population will slowly increase becoming more and more noticeable until one day, for no apparent reason, they will just simply disappear with only a few ever visible thereafter. This likely reflects nutrient flow within the tank. Should you find yourself in a position where you cannot wait for them to just go away on their own, they can be easily controlled (biologically) or eradicated using a whole tank treatment, but this is not without its own inherent set of risks. Biological control is once again afforded by the wrasses. In the previous article I discussed several predatory wrasses and all of the aforementioned wrasses are excellent at controlling the population of these critters, though six lines seem to do the best job. There is however, one other fish that is surprisingly adept at hunting and devouring red flatworms, that is the common blue or Springers damsel (Chrysiptera springeri). These guys are relatively cheap and are not overly aggressive, unlike some of the other damsels. They do, however, have quite the appetite for flatworms and will certainly help bring a population explosion under control. Another option is to add a few velvet nudibranchs (Chelidonura varians) to the system. These solely predate Convolutriloba species and will literally mow them down. 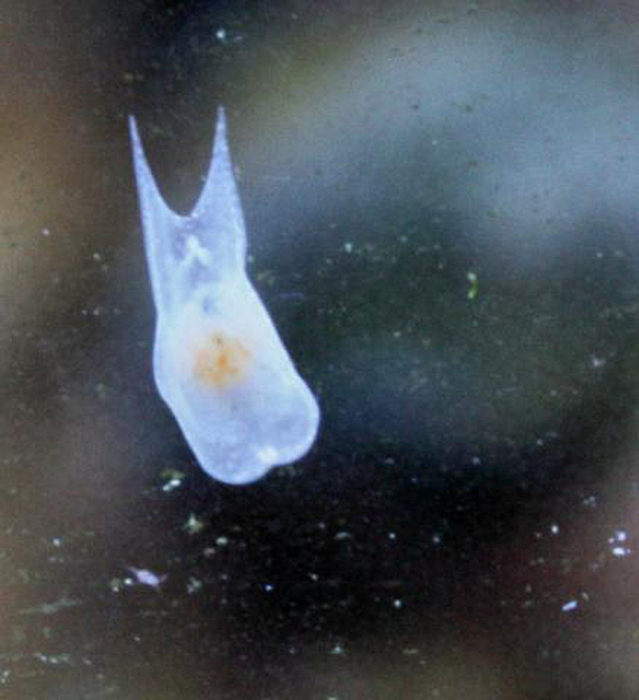 Being small and motile they can get to places you cannot reach with a siphon. They are however omnivores, and once the flatworms are consumed the nudibranch will most likely die. 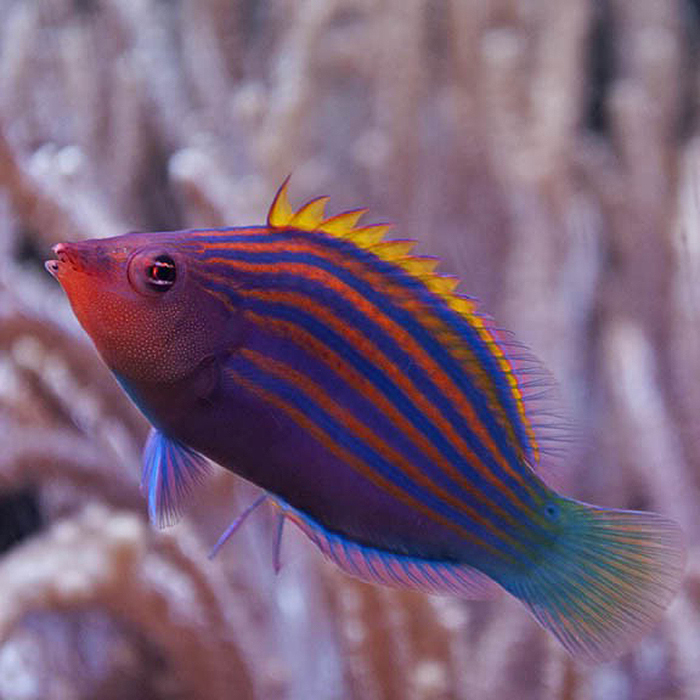 Many types of fish, such as this six line wrasse, feed on flatworms. 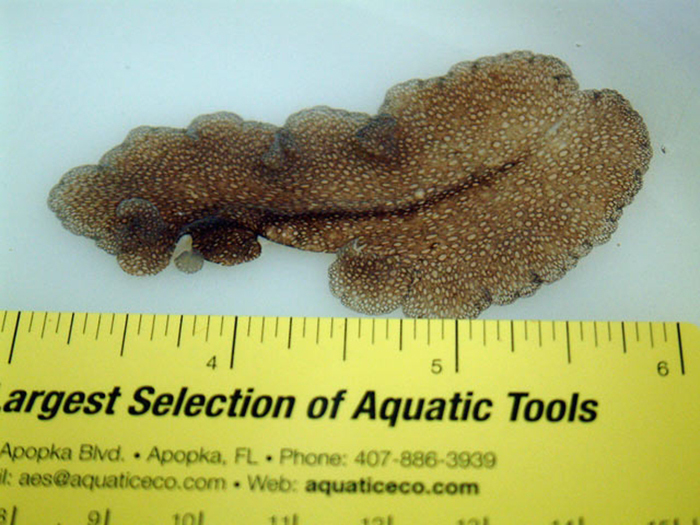 An image of an isolated Acropora-Eating Flatworm (AEFW). Of all the flatworms one could be blessed with having, these are truly the worst of the bunch. At the beginning of this series of articles I stated that when you find a pest, you shouldn’t panic… well AEFW are pretty much the exception to the rule. Once these are acquired, and detected, you either have to drastically change your habits or remove all your prized Acropora species. There are no in-tank eradication methods, biological control is sketchy at best and manual eradication is all but impossible. Once again, prevention is way better than eradication with these critters. Unlike many of the other pests in this series which are readily visible, the AEFW is extremely well camouflaged and almost impossible to see in a marine system. Their biology and ability to disguise themselves is discussed by Dr. Kate Rawlinson in an article in this magazine. Within that article she mentions that “theAcropora species affected by the AEFW include Acropora valida, A. pulchra, A. millepora, A. tortuosa, A. nana, A. tenuis, A. formosa, A. echinata, and A. yongei.” Of these, the two Acropora species that are the best indicator of infestation are A. valida and A. nana. These are relatively thick based, making viewing easier, but it is the light tan coloration of the coral that allows the easy identification of the small circular bite marks. These lead to an almost speckled appearance in the more shaded area of the coral and this is a clear indicator of a problem. Another indication of AEFW presence are eggcases. These are small dark brown spheres laid in a geometric pattern almost having the appearance of a tiny brown beehive. 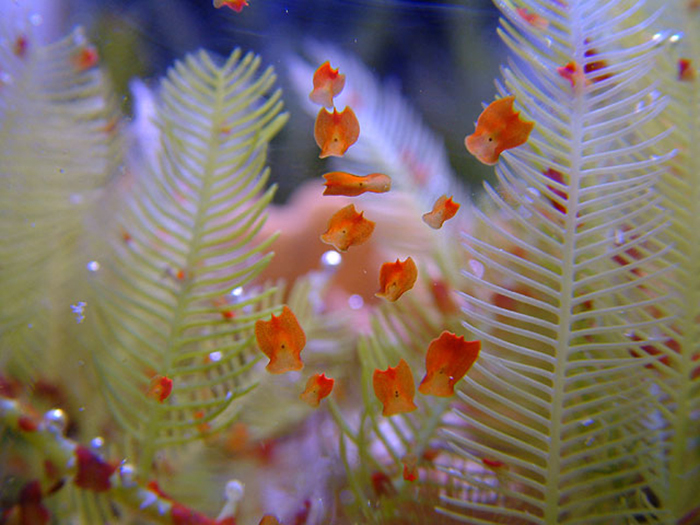 In her article, Dr. Rawlinson states that each egg can contain multiple embryos which hatch and immediately begin feeding on neighboring coral tissue. Considering that a single animal can lay multiple eggs, with multiple embryos, multiple times, it is not hard to see how a few AEFW can rapidly over run a tank. Typical bite marks from an Acropora Eating Flatworm infestation. So let’s assume the worst has happened, bite marks are seen around your A. validacolonies and you want to know if AEFW are what you have. The first step is to make a positive identification. There are two ways to do this – one is in tank, the other is out of the tank. Clearly the latter requires you to remove the affected coral. 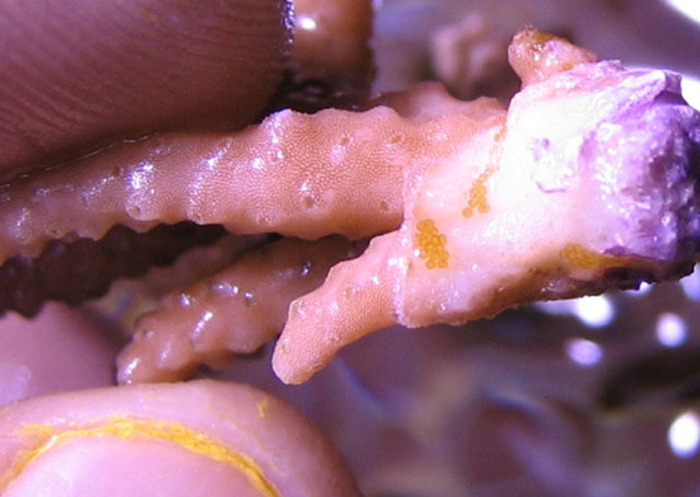 Once removed, look for the tell-tale signs of eggs around the base of the coral. These are very easy to see in most cases and are an absolute confirmation of your worst fears. Should you wish, and since the coral is removed, you can use one of the many proprietary dips to kill the adults that are presumably roaming all over the flesh. In the past, these dips have been effective at killing adults but have not killed the eggs. Recently, a new product has entered the marketplace with claims of penetrating and actually killing the embryos within the eggcase. I have not tested this on AEFW, but it does appear to be quite the potent killer of coral associated microfauna on a series of tests I have done with it. 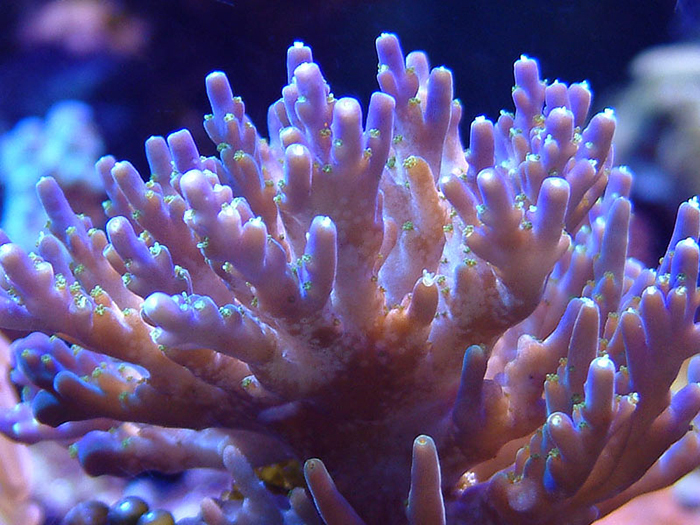 Produced by Reef Pest Solutions, “All Out” may offer the only hope for effective cleansing of incomingAcropora species prior to adding to a tank. Reading other peoples testimonials on this – it does appear to live up to the manufacturer’s claims. Having established that there is an infestation, a plan needs to be made to deal with this. In a tank with a few pieces of Acropora, the ideal solution would be to remove the Acropora leaving no living flesh behind. The tank is allowed to go fallow of Acropora for several months. The corals themselves need to be collected and dipped to kill the adults and quarantined in a separate system. If a dip is used that does not kill the adults, it is recommended that several dips, with a complete sterilization of the QT tank between dips, is performed. Even if “All Out” is used, I would recommend at least two dips are performed to ensure effective sterilization. After several months have passed and no more tissue loss is noted you can add the corals back to the DT and begin a more stringent QT program with incoming corals species. A brown “honeycomb” arrangement of AEFW eggs, each containing multiple embryos. In tanks that are very heavily stocked and encrusted with Acropora the above is not an option. In this case a combination of biological and mechanical removal can be used to control and limit the damage – but you can never be sure that you are ever pest free. Essentially you will have to come to terms with their presence and live with them. This may seem unacceptable to most, but once a program of control is initiated coral loss is minimized and their presence is reduced to more of a dull annoyance. This approach requires a drastic change in husbandry habits and a constant attention to the tank. It does however prevent the loss of your corals. The approach very much depends on the size of the tank, but essentially we are going to blast as many adults off of the infested coral into the water stream and happily watch our wrasses devour them as they wriggle about. In a small tank this can be readily achieved with a turkey baster. In a larger tank a powerhead with a nozzle, such as an unmodified Maxijet-MJ 1200 does the job nicely. The first time you do this it is likely that you will be amazed at how many worms you release from the coral. As disguised as they are while on the Acropora, once release they are clearly visible as small white disks. Wrasses would agree with this as they have no difficulty catching them as they are released in to the water flow. It is likely damsels will also take this opportunity for a free snack as well. This process is repeated on every Acropora and on the rock around it, as frequently as possible. Ideally this should be daily for the first week or so. It is likely you will notice a big drop in numbers over the period of a few days. This is not a sign to drop the frequency of the blasting, since the second wave of embryos will be busy moving up the coral eating as they go. After a week or so, the frequency of blasting can be decreased – though this decision should be based on the number of worms released each time. You may also notice that your Acropora colonies are also starting to look great. The reason they do so is that you are now doing something that was practiced by many early reefkeepers, but has since fallen into disfavor over the years – that being the blasting of rock and corals with powerheads to dislodge and remove detritus. The periodic increased water flow over SPS helps remove accumulated slime, debris and other minor irritants (even if you don’t have AEFW, try this and see the results in a month or so). Should you take this approach, there is a slight modification of this method that may increase the effectiveness. It is known that freshwater dips will stun and dislodge AEFW. As opposed to blasting with a powerhead, at such time when a top off of the system is required, take the incoming freshwater and blast that into the coral skeleton. This will likely have no effect on the SPS but will drastically increase the number of worms released. (I would recommend testing this on non-prized specimens prior to rigorous blasting, but have yet to see any untoward effects on corals following this treatment regimen). Whichever method you choose, diligence is the key, but very soon a large infestation can be controlled to the point of it becoming asymptomatic. Do not however, ever make the mistake of thinking that the worms are gone. They are there, in small numbers hiding in the dark, hard to reach areas waiting for a lax in your attention – at which point they will begin once again to proliferate. As an aside, I have heard from several hobbyists that the wrasses in the system appear to become more adept at hunting AEFW after a month or so of these treatments. Presumably this is due to training them to accumulate around the Acropora heads to catch the worms released from the coral. 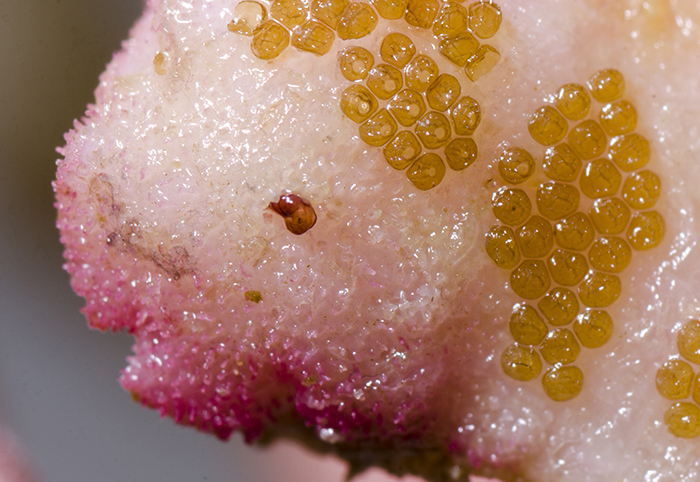 Close-up of AEFW egg mass; if you look carefully you can see the developing flatworms inside the eggs. Photo by Marcin Smok. With this, I close this series on pest free reefkeeping. The critters mentioned in these three articles cover most of the common pests we may encounter in our systems. It is likely you are reading this series because you have encountered something that is either colonizing your tank or killing your corals. At this point eradication is your only option (if possible), but I cannot stress enough how important prevention and quarantine is when dealing with captive systems. With the increased frequency of frag swaps and the promotion of eco-friendly frag farming, it is likely that many rare pests will become more and more prevalent in the hobby. The only possible and potentially successful barrier to this spread is the vigilance of individual hobbyists. I hope you have found this series informative, and that it may in some ways allay an initial panic from identification of a pest. The information I present is based mostly on my experiences and those of other hobbyists I know. There is a vast amount of information out there and I would highly recommend reading and weighing all the options prior to beginning any form of eradication in your own system.